I have been thinking a lot lately about the direction I'd like this little piece of the internet I claim as my own the take. Since closing my studio and surrendering my roles and responsibilities as a studio owner, I have had a lot of time to consider how I'd like to go about utilizing the content I'd acquired and created over the years. I felt it was best to continue with my blog and to also include areas where I could make use of resources I have at my disposal. I hope you enjoy the new look and layout of my blog. 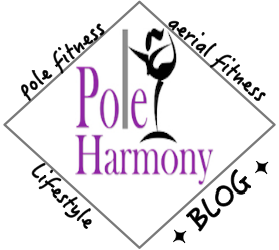 I am working on linking the domain www.poleharmony.com to this blog so eventually (if not already) the blog's web address will change. I need my husband to help me figure that one out or at least to wait the full twenty four hours for the domain to work. Please feel free to suggest any additional upgrades you'd like to see. I will be reclaiming my former Pole Harmony social media accounts as the blog's so if you have been following Pole Harmony on Facebook or Instagram, all content from here on out shared will be about my latest blog posts and additions to the new site. Thank you for continuing to read and support my writing and I hope you enjoy the new direction and design elements to my blog!